Jake Bier, founder of War Streets Brewery and Imbibe Northside, stands in his nanobrewery located beneath Bier's Pub on Western Avenue. Jake Bier, founder of War Streets Brewery, discusses the roots of his nanobrewery and the chance encounter that put his annual event, Imbibe Northside, into play. From dark, empty rooms, to sculptures as high as the ceiling and even a life-size dollhouse, The Mattress Factory in Pittsburgh’s Northside is no stranger to largescale exhibitions. But this February, the modern art mecca will host an exhibition of another kind. The fourth annual Imbibe Northside, an exhibition of local alcohol purveyors started by Jake Bier, owner of War Streets Brewery, in 2016, will take place at The Mattress Factory on Saturday, February 2 from 6 to 9 p.m. Nine different local Pittsburgh breweries and wineries, seven of them based in the Northside, will be featured and offer unlimited tastings of their products. Accompanied by tunes from The Alex Talbot Trio, a local rock band, guests can enjoy libations from some of Pittsburgh’s finest brewers, including Allegheny City Brewing, Penn Brewery, Threadbare Cider and Mead, PGH Winery, and Bier’s own War Streets Brewery. Galleries in The Mattress Factory will also be open and available to tour during the event. Bier initially conceived of Imbibe as a way to introduce War Streets Brewery to the Northside community. “When we were trying to open the brewery, we wanted to do an event that would introduce us to the neighborhood—a fun drinking event to showcase the manufacturers making alcohol in the Northside,” Bier said. With the success of the first iteration of Imbibe, the party has since become a twice-a-year event, taking place in both winter and summer. The collaboration between War Streets Brewery and the Mattress Factory came about out of fortuitous happenstance. During an evening out in the neighborhood, Bier had a chance encounter with Michael Olijnyk and the late Barbara Luderowski, founder of The Mattress Factory, which would eventually spawn Imbibe Northside. “I accidentally walked into their house during a fundraising event for John Fetterman,” Bier said. “I just happened to stumble in there, thinking it was a public event, and they were very nice.” From there, Bier was connected with the events coordinator of Mattress Factory, and the idea for Imbibe grew. Bier first opened War Streets Brewery in 2016, in a space in the Mexican War Streets, hence the name, but his business wouldn’t stay there long. Once the brewery was situated in its current Western Avenue location, Bier named the space Bier’s Pub. He opened the main floor as a restaurant and bar and ran War Streets Brewery out of the basement. Since opening Bier’s Pub, Bier has taken care to put his own touch on the space, starting with a renovation of the interior last year. 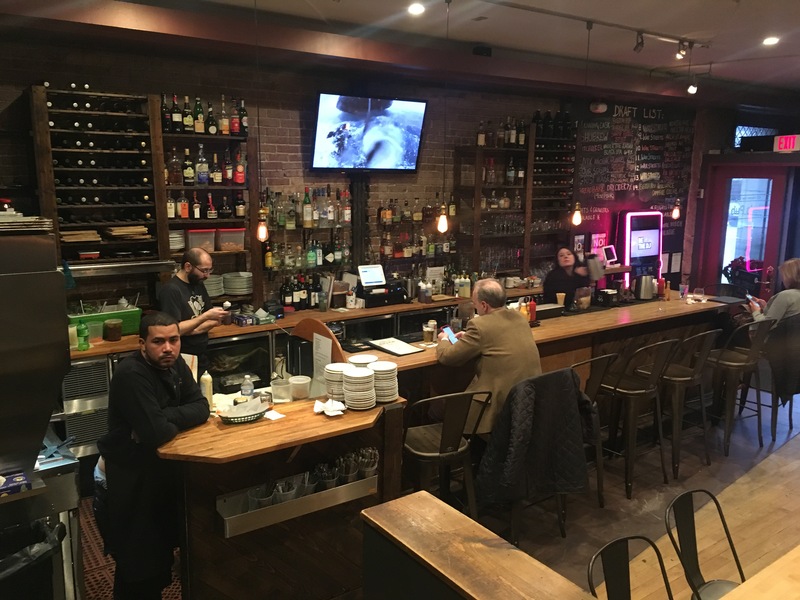 The restaurant area of the space was completely repainted and reupholstered, and the back room was fitted with a new bar area and new wood flooring. A series of large-scale portraits by Florida-based artist Marcus Zotter decorate the walls. “[Zotter’s] uncle lives in the Northside, so he got us connected,” Bier said. The front room hosts paintings of Pittsburgh icons, like Mister Rogers, Andy Warhol and Bette Davis. The back room features paintings of people that inspire Bier, like Bob Dylan, Dolly Parton and his dogs. While the restaurant space invites guests as a welcoming place to hang with friends, downstairs is where the real action happens. The small setup for War Streets Brewery, called a nanobrewery because it produces less than 100 gallons at one time, runs every day right underneath patrons’ feet, creating the ales that are sold at the upstairs bar. “We do everything from amber ales, IPAs, stouts, red ales—just going across the board with different ales,” Bier said. While future plans for Bier’s and War Streets occupy much of his time, Bier recognizes that events like Imbibe are important for an ever growing Northside. Tickets for Imbibe Northside are available for $40 per person online, and $50 at the door. Doors open at 6 p.m. For ticket information, click here.